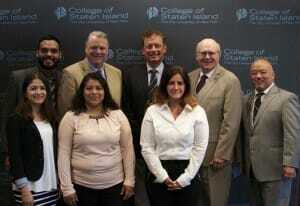 The College of Staten Island hosted a press conference on June 18 to announce a $350,000 grant received from the Staten Island Performing Provider System (SI PPS). To date, the College has received approximately $700k in funds from the organization. At the event, the College recognized the SI PPS for driving transformation within healthcare on Staten Island, impacting more than 180,000 borough residents. As for SI PPS funding at CSI, these funds are used to provide scholarships for students pursuing degrees in mental health, social work, and the Master of Science Healthcare Management Certificate. In addition, the award will fund workforce development training initiatives for the positions of Community Healthcare Worker (CHW), and Care Manager. In attendance were CSI President William J. Fritz, SI PPS Executive Director Joseph Conte, SI PPS Senior Director of Workforce Transformation/Human Resources William Myhre, and CSI Vice President for Economic Development, Continuing Studies, and Government Relations Ken Iwama. Scholarship recipients were also in attendance to share how the funding enabled them to complete their degrees. Without this funding, many of the students would not have had the financial means to complete their studies. In addition, graduates of the CHW program shared how the training program significantly changed their course in life, setting them on a path for a successful career in healthcare. CHW graduate Maribel Espinosa stated, “Every day, I use the skills I learned in the training and my community directly benefits from what I learned in my CHW training.” Espinosa was enrolled at CSI as a double major in International Business and Spanish. As of May 31, she is now a proud CSI graduate.